Fresh from her summer guest chef appearance at Latitude [a cultural center, organized as a nonprofit association] in the Lot Valley of southwest France, noted local chef and caterer, Debra Dawson exudes boundless energy when she talks about the changes she found in the land that cultivates gourmands and holds the highest standards for the art of the table. While traveling again in France to revisit old friends and assess the state of food and cooking in a country known for its epicures, she could not help comparing France today with the France of her first encounters years ago, in the early seventies. After graduation from U.C. Berkeley, Debra took a break before grad school to travel in Europe. She fell in love with the French way of life, and especially with French cooking. "I ended up staying there for three years. Living on a remote farm, I was forced to learn French; I had to learn French in order to survive. It was a completely peasant environment in the Brie-Champenoise region, east of Paris. It was so remote," she laughs, "that Americans had been heard of, but never seen!" "When I was first in France, I couldn't understand why everyone seemed obsessed with food, but by the time I returned home to America, I was as obsessed as everyone around me. Food is a serious subject. When a French family sits down to eat, they will talk about the food; about every course—how the dish tasted last week as compared to today, how the recipe differs among the mother, the aunt; grandmother's version and so on. They compare the rabbit they're eating with the taste of the rabbit raised down the road. They talk about the weather and how this year's crop compares with last year's. What a contrast to America today and how lacking in that attitude towards food we seem to be here! "I lived with my then-partner Jacques Peré in a stone house without electricity or running water. We had no oven, only a fireplace and a small two-burner stove." She enthusiastically describes this formative time in her life. Slow food cooking, which is now enjoying a revival, was a necessity then, a way of life. Slow food means literally that—foods simmered, cooked for a long time, melding the flavors. 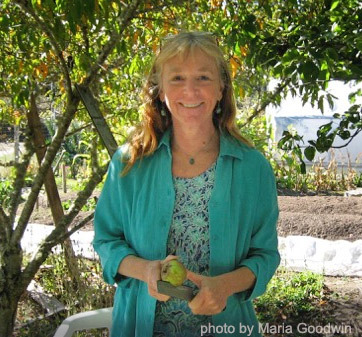 "Slow food is also about learning to cook what you have," Debra explains. In France, as in most of Europe, whole areas are devoted to whatever is prominent in that particular region. If it's an area with lots of livestock, that place has cheese makers and sausage makers. An area with grapes and fruits will have, besides wines of the region, unique jams and liqueurs and so on. If an area has acorns and chestnuts, it has hundreds of recipes for using acorns and chestnuts. Nothing is wasted." These traditions seem to be lessening in France as in all of Europe. There is still an interest in acknowledging and retaining the old ways of doing things, but global changes are having an effect in most parts of the world. Where before, village life was self-contained, now people must drive to jobs an hour away, and more of the young people are abandoning agrarian village life. As she deftly pares apples for a dessert, Debra continues. "People complain there's no time to cook—it's true cooking requires preparation time, but the end result is worth that preparation." She insists that we can work into our daily lives the time to prepare and preserve our food. She points out the starter for sourdough bread on her counter. "Think of it like having a pet—the starter is something you take care of, you check in on it, but you don't have to be aware of it all the time, just occasionally. The cycle is always in progress, the starter is alive, it's brewing, so to speak, the shaped loaves are ripening, and then there's the unparalleled aroma of fresh bread baking! I've often taken a bowl of rising bread in the car on errands; just park in the sun and watch it grow! You can make a batch of stock whether it's beef, chicken or vegetable, freeze it, and keep it on hand as a base for soups and stews. Then when you need it, it's there." Debra sees food not just as momentary pleasure that's gone when you leave the table, but essential to maintaining health—not only as part of an evening out, but as a focal point of the home. "I always try to encourage anyone who is learning to cook," she says. "Besides being fun and creative, learning to cook is one of the quickest shortcuts to good health." True to the philosophy that she expounds to others, Debra grows much of her own food. She credits her partner, John, with their impressive garden. "John is the other half of the equation," she adds, "I couldn't manage a garden this large and do the ordering, planning, and preparation necessary for a catering business." Even in this transitional period from autumn to winter, the garden is lovely, redolent with the scent of herbs, vibrant with hardy deep red, or pale green lettuces, and a variety of mustard and collard greens. In the cool coastal climate, a greenhouse insures plenty of scarlet tomatoes and many shades of peppers. "Because I'm around so much good and, often rich, food, people frequently ask me how I stay trim," Debra remarks. She believes in eating only the best food, "…wonderful things, no junk. Eat what is good and cook what is good: use quality, organic ingredients. Our palates are so corrupted by sugar and fat that (our palates) equate rich and sweet with good. It's sad, given all the wonderful foods one can try. You can eat wonderfully and not spend a fortune, if you learn the basics of cooking. So many people struggle with diets that focus on what is forbidden which results in a futile cycle of frustration and repeated failure. A more successful, and pleasurable approach would be to concentrate on obtaining really good nutritious food and learning to cook it properly." Debra feels food awareness and the culture of food are changing in the United States and that we are moving forward in our thinking about food. "We're going full circle, but that doesn't mean going backwards; we're returning to something that we've nearly lost." With enough consciousness on the part of all of us—farmers, consumers, everyone—she hopes there will be a realization and respect for the old ways, which have sustained generations for so long. There is a reason why the same methods were used for hundreds of years—they worked! And despite modern methods, those old techniques still have value. There is much for us to learn from those old ways. With some adaptation, they can be incorporated into today's way of life. Debra acknowledges that preserving old ways is not without effort. She mentions kung fu—the words mean "daily practice." "The more you do something the better you get at it, whether it's running, cooking, swimming, making music—incorporate it into your daily life. When I plan my day I say ‘when will I fit my exercise in, not will I or how will I.' " Debra's vitality and energy is evident in her disciplined approach to life. After her years in France, Debra returned home and brought her newly discovered influences with her. With Jacques Peré, she operated Café de la Grange [formerly on Main Street in Mendocino, now the Highlight Gallery] and later, in the eighties, Little River Café [formerly behind the post office], bringing French country cooking to the coast. In the eighties she moved on to the Navarro Ridge Inn; during that time her son was born. She recalls nursing him, putting him to sleep in a linen closet and turning her attention to the evening's menu. "One evening I thought I'd make my first cheesecake. I had three recipes pinned up in front of me and ended up making my own version gleaned from those three recipes. It happened that the owners of the newly opened Chocolate Moosse Café [now simply The Moosse Café] came in, had a piece of that improvised cheesecake and asked me to make it for the Moose. Eventually, I supplied the Moose with their soups and other specialties for seven years. It was there I developed my herb blends; experimenting with seasonings by making soup out of everything that grew, flew, swam, mooed or bleated for all those years. My strength as a chef is with simmered foods and seasonings, in making things taste wonderful. "It's the chemistry I'm good at," she continues. "I have a sense of flavors that's not from a cookbook—it's something you can't learn out of a cookbook. I've eaten enough good food to know what really good food should taste like." She notes that some of the trendy new cooking, somewhat glamorous and precious, looks as if it were created more to be looked at than eaten. As if the demands of a catering business are not absorbing enough, Debra still makes time to maintain her own healthy lifestyle, balancing cooking with playing music. She has a history of another life as a musician. "I played violin as a kid, but didn't seriously resume until I was about thirty." Her interest revived when a group led by Arrigo D'Albert performed French and European music in Café de la Grange. "Hearing them play completely swept me away. I learned hurdy-gurdy from Arrigo and restarted the violin. With the group, Tour de France, we played wineries, universities, weddings—even appeared on ‘Prairie Home Companion.' [a radio variety show] It was great fun." The traditional French music was just about to die out in France in the early seventies when Arrigo D'Albert emigrated with his hurdy-gurdy to Mendocino. In France some recordings were made, the music gained popularity, especially among young people and there was quite a revival. Now it flourishes throughout France and abroad. Unlike our own country, however, the preservation of this historic music is supported by the government. Debra's passion for food extends to sharing information and teaching others. Yet another venue for this is her live radio show, "Grassroots Gourmet," on local public broadcasting, KZYX & Z, 90.7 FM. Aired the third Monday of each month, "Grassroots Gourmet" features issues of interest to people who eat, with diverse guests in all fields of food production and cooking. She is a warm and welcoming host who thoroughly researches the material and puts guests at ease. The result is a program with varied perspectives and the latest information for listeners. "We are so fortunate in this area, not only to have a true abundance of good food and wine as fresh and organic as possible, but we have many fine chefs who really know what to do with that abundance. We are lucky to have some superb restaurants, some star-quality chefs, and many unsung heroes working in those kitchens and in catering, including Georgia Lane, who has worked alongside me for years—I could never acknowledge her enough. She is invaluable!" Debra's line of custom seasonings, Good Thyme Herb Blends, is available in stores locally and by mail order. Her cookbook, Good Thyme Herb Blends Cookbook, A User's Guide is also available by mail and in local bookstores. Also, she teaches cooking classes occasionally for College of the Redwoods in Fort Bragg. "We don't always have to go out to have a wonderful time. There can be a return to making one's own fun at home—making music, gathering with friends, cooking good simple food together, isn't that part of what Thanksgiving is all about?" Copyright © Good Thyme Herb Company. All rights reserved.